Advanced Nutrients Carboload Available in 250ml, 500ml, 1L,& 4L Yes. Just like many athletes "carb load" before a big competition, eating extra carbohydrates so they have more energy on game day, your plants also need to load up on carbs before they can perform at their best and bloom into the huge, luscious plants you want them to become. 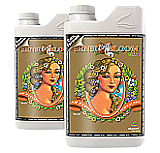 Advanced Nutrients pH Perfect Sensi Bloom A&B Sets Available in 1L, 4L, & 10L Sets Sensi Bloom A + B has been specially designed for use with all hydroponics, sphagnum, coco coir and soil growing mediums. 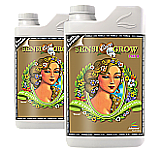 Sensi Bloom A + B has been developed for use with any and all hydroponics, aeroponic, drip irrigation, NFT, flood and drain and continuous liquid feed growing systems. Advanced Nutrients pH Perfect Sensi Coco Grow A&B Set Available in 1L, 4L, & 10L Sensi Grow A + B has been specially designed for use with all hydroponics, sphagnum, coco coir and soil growing mediums. 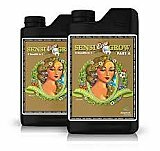 Sensi Grow A + B has been developed for use with any and all hydroponics, aeroponic, drip irrigation, NFT, flood and drain and continuous liquid feed growing systems. Hydroponics experts at Advanced Nutrients saw that Kushie Kush™ is a must-have for the medical community, so company co-founder Michael “Big Mike” Straumietis asked his team of plant scientists to immediately find what makes Kush tick and what fires up its flower-making machinery. Advanced Nutrients Nirvana Available in 250ml, 500ml, 1L,& 4L In your relentless quest for larger buds that are worth more to you and your associates, you now have an all-organic formula called Nirvana.